Henry Eden is fourth son of the late Thos. Eden, Esq., of "Wimbledon, co. Surrey, Deputy-Auditor of Greenwich Hospital, by Mariana, daughter of Arthur Jones, Esq. ; brother of John Eden, Esq., a Major in the Army, and of Arthur Eden, Esq., Assistant-Comptroller of the Exchequer ; brother-in-law of Lord Brougham, and of the late Admiral Sir Graham Moore, G.C.B. ; nephew of Sir Robt. Eden, Bart., who was Governor of the province of Maryland in 1776, as also of the late Lord Auckland; and cousin of Capt. Chas. Eden, R.N. 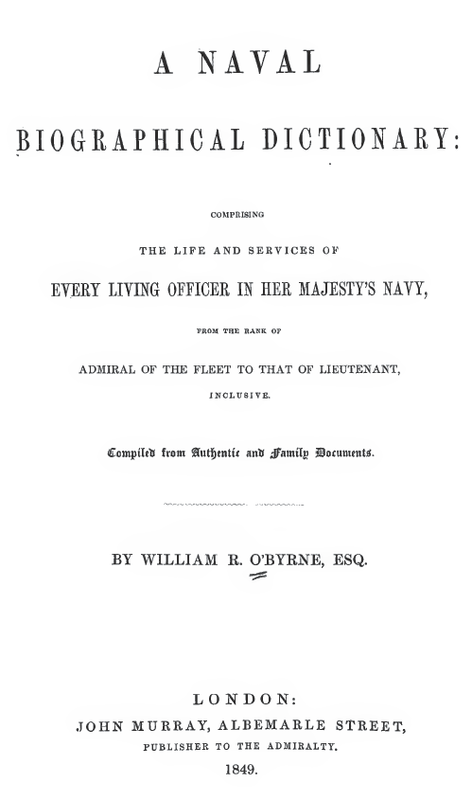 This officer entered the Navy, 15 June, 1811, as Fst.-cl. Vol., on board the Acasta 40, Capt. Alex. Robt. Kerr, with whom he cruized most actively on the Home and North American stations, latterly as Midshipman, until Aug. 1815. In Nov. following, after an intermediate attachment to the NAMUR 74, and Tonnant 80, flag-ships at the Nore and at Cork of Sir Chas. Rowley and Sir Benj. Hallowell, he joined the Axceste 38, Capt. Murray Maxwell, and soon afterwards sailed with Lord Amherst on an embassy to China—while on his return from which country, in Feb. 1817, he suffered shipwreck in the Straits of Gaspar.